The Use of the "Lights"
Whether we deal with transits or with progressions, we are considering the relationship of the individual as a whole to the general pattern of his experience and his personal development. We are dealing with generalities and potentialities, with categories of events and broad types of personal response. Neither transits nor progressions refer to exact particulars. Both planets and houses or signs can mean many and varied things, at several levels. The indications they give are never of themselves precise in terms of concrete events; they become precise only if the trend of the person's life and the issues to be met are already distinguishable and well established. The transits and progressions, then, reveal what can be expected in the line of such trends or confrontations. Otherwise, the astrologer can only surmise possibilities, the actualization of which might take place along any one of several lines. The focus of the astrologer's advice has to be upon the individual and his adjustments to life, not upon specific events or confrontations. There is, however, a type of astrology in which particular confrontations, problems and crises, instead of being deduced as possibilities from general patterns of personal adjustment to life, are considered as primary factors and starting points. It is called "horary astrology" — the term "horary" meaning "of the hour." Horary astrology is the astrology of particulars. It deals directly with stated particular cases and situations, and the individual person facing these particular setups of experience appears in horary astrology in a special role. He punches the clock at the entrance of the realm of conscious living; that is, he signifies his willingness to start consciously to work on whatever problem is his at the time. He establishes his need and his readiness to meet it in terms of a universal purpose, to meet it with that intelligence which, while it is individualized through an individual mind, is essentially a universal factor. The life of the average man and woman is conditioned by biological impulses or feelings, egocentric responses to experience, patterns of traditional behavior and socially expected reactions, and by a confused or unsteady yearning toward some ideal state of being. The individual may think about many things; he may even have a brilliant intellect quick at associating remembered data and at reshuffling the cards filed for reference in his brain — and yet he may not live in the least according to the "conscious way" of true intelligence. He probably knows what he wants, and his intellect may discuss the pros and cons of every life-situation in terms of that "knows" and that "wants." He may display the kind of social intelligence about which intelligence-tests give data — a ready faculty for adapting himself to social situations and the demands of collective living. But all this does not deal with what I call here "conscious living." It refers only to biological, egocentric or social behavior. "Conscious living" means living as an individual, differentiated from the average, conscious of a purpose, and determined constantly to adjust his life (behavior, feeling and thinking) to the requirements of that purpose. If the individual sees himself as an individual separated from all else in the world, and if his purpose is egocentric and unrelated to anything greater than his self, we have a kind of living which is negative, basically destructive, and purposeful rather than conscious. True consciousness implies a deeply felt and acknowledged relationship between the individual and the universe. An individual unrelated to the universe is a fiction. No individual lives in a vacuum. Related he is — to a group, a society, mankind, the universe. If he is not fully aware of this state of total relatedness he cannot be called truly "conscious," however brilliant his intellect, his social cunning and his success. He lives in terms neither of true intelligence, nor of spirit. Intelligence is the focalization of universal harmony into the individual mind. It is the adjustment of the individual to the universal, of particular actions to the universal purpose which alone makes them spiritually significant. To live according to the "conscious way," the way of true intelligence, is to live in terms of one's essential place, function and purpose in the universal Whole. It is to will one's destiny; to become step by step the totality of what one potentially is. It is to fulfill the universal Harmony at the place and at the time one is called upon to act. It is to become, as a concrete personality on earth, one's natal Sky. It is to do so, not only in a general way, but every day, at every moment, with the greatest possible efficiency, accuracy and purity of motive. But, how can we ever be sure that we are living in such a way? What standard of value, what frame of reference can there be against which we can test the validity of our acts at the precise time when we face a new test, a new crisis, a new problem? Astrology answers: "Consider the sky. Question its ordered patterns. Ask of the universal Harmony for an answer. Just as Nature has a cure for every ill, so the sky has a solution for every problem. Every individual need, consciously and clearly formulated, and stated with fervent eagerness, is always filled by the spirit — if the individual does not close his door to the spiritual influx and the divine message." Intelligence, as I have defined it, is a universal factor. It is potential in every human being. It pervades the entire universe. All that is needed is for the individual to produce a "lens" able to focalize it, and a mind able to receive and contain its emanations. There are many kinds of lens and mental containers, but intelligence is one and the same everywhere. It is in every organic whole, as it is visible in the sky. If we can decipher it more easily in the sky, it is because, there, it is made simpler and more structurally clear by the remoteness of the celestial bodies, by the fact that we — the questioners, the ones in need — cannot disturb the celestial patterns in any way; also, because the experience of the sky and of its lights is one of the most vital and most ancient among experiences common to all men. However, what is essential is to know what we are seeking for; it is our attitude toward the seeking; and as well toward the answer we receive. What is essential is to realize that we can reach this intelligence directly, as it becomes focused into our mind, when we are ready for it, just as well as indirectly when expressed through our relationship to the universe and particularly to the solar system which is the "living space" of our Sun, source of our vitality. Intelligence is the active manifestation of universal Harmony; and therefore wherever disharmony is produced, there must also be an effort to re-establish harmony. This is the law of compensation, whether it be seen by occultists as Karma, or by psychologists as the principle of "psychological compensation" (C.G. Jung). Because of it, every emptiness must be filled, every need must be satisfied — provided there is not something in the empty vase or the person in need which blocks the way to the re-establishment of harmony. It is on these principles that the true kind of horary astrology is based. Every horary chart cast in answer to a need which is well-formulated and real should be considered as an expression of universal intelligence seeking to re-establish the harmony disrupted by the crisis or the problem which caused the personal need. The person in need could have found a direct answer within himself if his mind had been effectively open to the influx of intelligence call it "intuition" if you will, or "God's answer to his prayer." But if the individual's mind is too confused, cluttered or anguished to form itself into a "lens" to focus the universal intelligence constantly seeking to re-establish harmony, then an intermediary or a mirror must be found to do the focusing and the objectivizing. The intermediary (or "mediator") may be a spiritual Personage (a great Prophet, for the race at large, or a Guru — even a psychologist, if of the right kind — for the individual). It may be an astrologer able to decipher and interpret the "sky's signature" through the technique of horary astrology. The technique is basically simple; yet exceedingly difficult to apply significantly, correctly and wisely. Horary astrology is an art. It needs to be practiced by individuals who have made of themselves — consciously, or sometimes unconsciously — channels for the expressions of universal intelligence; who have in one way or another — some ways are far safer than others! — reached a state of "openness to the world" and of inner tranquility, or of vibrant, yet detached, sympathy with human beings. The safe and sound practice of horary astrology requires a basic knowledge of its technique; but it demands also of the practitioner a deep sense of psychological values, and as deep a sense of responsibility to humanity as a whole and to God Who is the personification of this universal intelligence. The practice of horary astrology rests upon the erection of a horary chart for the exact moment at which a personal need comes to a focus of attention, or a personal crisis comes to a head. The horary chart is cast like any birth-chart for the moment in consideration; but the interpretation of the horary chart obeys a number of rules which differ noticeably from those used in natal astrology. What these rules are has been stated most significantly and expertly by Marc E. Jones in his book Problem Solving by Horary Astrology, and the interested reader is referred to it, as the matter is too vast to be considered here. I believe, however, that no horary interpretation can be complete and spiritually valid unless the interpreter realizes fully that horary astrology is not just a method — rather queer and mysterious — to get "one's problems solved" without much effort, but the expression of a profoundly spiritual attitude to life. Horary astrology is a practical technique based on a philosophy of reverent relationship to the universe and to that universal intelligence which most men consider as the very substance of the Deity. If the practitioner is not aware of that relationship and of the fact that every horary chart is a focalized expression of universal intelligence, then, even though the horary answer may be correct, the results are bound to be inadequate and sometimes tragic. I said that as an individual asks the sky for an answer to a vital problem or crisis confronting him, he thereby, intentionally or not, signifies his readiness to meet the confrontation in terms of "conscious living." It should be clear, however, that this readiness exists in the average person who asks for horary advice only in a negative manner. The asking may be done because everything else has failed, or because there is no logical and intellectual way of ascertaining how events over which one has no control will develop, or because it is an easier way than to study deeply the matter, or in order to evade personal responsibility — or worse still, out of sheer curiosity. These are all negative attitudes. The positive attitude might be characterized as an attitude of prayer. According to it, the individual seeks to ascertain the will of the universal intelligence with regard to the particular confrontation he is meeting. He does not seek to evade his responsibility, but rather to increase his responsibility by making it as fully conscious as possible by relating it to the universal purpose or "plan" of life, or of God. It does not lead to a blind and superstitious following of the answer revealed or suggested by the horary chart, but instead to a new adjustment of one's efforts in becoming conscious of the purpose behind the confrontation, and of all the factors implied in the issues. A horary chart does not say: do this! It presents a symbolic image of all the essential factors in any critical situation, an image from which purpose to the patterning of these factors can be revealed — if the interpreter is able to see this purpose emerge. Sometimes the purpose — that is, the constructive directive or solution — is very evident. In most cases, it is not. It may require as great an effort of attention to decipher the answer outlined by a horary chart as would be the attempt to solve the life-problem by ordinary means. Horary astrology is not a saving of effort, or intelligence; it is a reorientation of effort and intelligence. It does not make life easier, but man more conscious of the total implications of the difficult turning points at which he has to make choices. It aims at providing a universal dimension to choices, instead of a strictly personal and narrow one — a "fourth dimension" of the will, in which time becomes a determinant and the proper timing of actions and decisions on the background of universal cycles is made possible, even in the smallest acts. 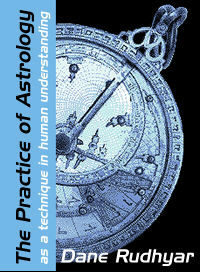 The act may be small, yet it must involve a vital need if the horary chart can be counted upon to give a vital answer. He who is to act must consider his questioning an implicit pledge to act consciously in an inner attitude of openness to the revelation of universal intelligence focused upon him, and to assume thereby a fuller responsibility for the actions. The responsibility is greater, in as much as the action ceases to be conditioned strictly by personal choice and becomes an expression of the guidance of this universal intelligence. He who does not know the total pattern cannot be blamed for not fitting into it. He who knows it breaks deliberately the structural harmony of universal life if he fails to live according to his knowledge. So far, we have assumed that the person who is confronted by a vital problem or crisis is the one who erects the horary chart and seeks to discover in it the solution which the universe is potentially offering at any time to any seeker who asks in the right way. However, it is as difficult for the individual to interpret a horary chart erected to solve his own crisis, as it is for the average student of analytical psychology to interpret his own dreams. In either case we deal with the interpretation of symbols; and if the interpreter is subjectively involved in the crisis — if it is his own crisis he is likely not to be objective enough to interpret the symbol without coloring the interpretation with his own emotional and intellectual biases or confusion. Thus the need, in most cases, for an interpreter who should be a "mediator" between universal intelligence and the confused or impotent mind of the enquirer — a mediator who should be able to focus in complete mental tranquility and detachment the message of this universal intelligence. Thus also the value of commonly acknowledged principles and rules of interpretation as means to guide the interpreter; for the more the latter bases his judgment upon the traditional meanings rooted in the common experience of those who came before him, the more his mind is likely to become a steady focus for the expression of universal intelligence a focus unblurred by individual biases or argumentative attitudes of the intellect. In horary astrology the individual faces the universal; the part faces the whole. Horary astrology works because the whole acts upon the part whenever that part is in vital need. Just as the human body as a whole secretes instantly anti-toxins and hormones to come to the help of any injured cell or organ, so God (as personification of universal intelligence and spiritual vitality) always seeks to restore harmony and health in every individual whom life has thrown off balance. This divine effort to re-establish harmony in every disturbed individual is the substance of "Grace." It is the Whole coming to the help of every one of its parts. Horary astrology is a dramatic presentation of the operation of this divine Grace. Every properly timed horary chart is a celestial pantomime through which the universe seeks to impress a message upon every man in a state of crisis or vital difficulty. It must be "properly timed," and horary astrology offers technical means to show whether or not the question has been asked at a significant time. These are the traditional "considerations before judgment" and even more perhaps the state of correlation between the horary chart and the natal chart of an enquirer. A horary chart is "radical" if it shows itself to be in dose structural relationship to the situation it is called upon to resolve into harmony. Here also the fact that an astrologer is asked to cast a horary chart helps greatly to establish a proper timing. The chart is properly erected for the time when the impartial mediator (the astrologer) becomes aware of the situation — when he is asked the question. He is to provide the focus of the interpretation, the channeling of universal intelligence into humanly understandable words and directives. It is thus as his attention is at first focused upon the matter that the "act of Grace" is released which can solve the problem. The real function of horary astrology is to establish a state of relationship between universal intelligence or divine Grace and the individual person buffeted by the cyclic storms or repolarization and the baffling confrontations of experience. It is not "fortune telling" as an escape from personal responsibility and effort, still less for curiosity's sake. It is instead a sign of the conscious binding of the individual to the rhythm and purpose of the universal Whole in which he accepts full and deliberate participation. From this Whole the individual receives understanding and healing, and the key to his many problems, in proportion as he is willing to consciously fulfill his function and his destiny.